During my visit to the Alaska State Museum, I was drawn to an Arctic wooden doll from near Unalakleet that was gifted by Marjory B. Major. Its year of origin is unknown, but I was interested in it because of my connection to Unalakleet (I spent a week living and teaching music there this year through the rural practicum experience), and because it was part of an exhibit that talked about the introduction of reindeer to Alaska by Captain Michael Healy and Sheldon Jackson in the mid-1800’s. I learned that Healy and Jackson hired Sami reindeer herders from Norway to come to Alaska in the 1890’s and teach Native people the trade so that they had a new food source, since the land was depleted of other animal food sources. This doll was believed to have been owned by a child of one of the Sami herders. In 1937, an act was passed so that only Alaskan natives can herd reindeer. I thought it was fascinating to learn how this way of subsistence was introduced to Alaska and continues to be a major food staple to this today. In addition to the Unalakleet connection, I also gravitated toward the reindeer exhibit because before moving to Alaska last year, I actually did not know reindeer were real! I always thought that they were a myth, so I was very excited to see how wrong I was as I conducted my preliminary rounds of research, pre-Alaska-move. I would like to know more about the child and the family who owned this doll, and I wonder where the doll was found to begin with. How do they know that it’s possibly from near Unalakleet? Beyond the doll, what was the interaction between these Norwegian herders and the native Alaskans like? Did all Alaskans likes this collaboration of cultures? 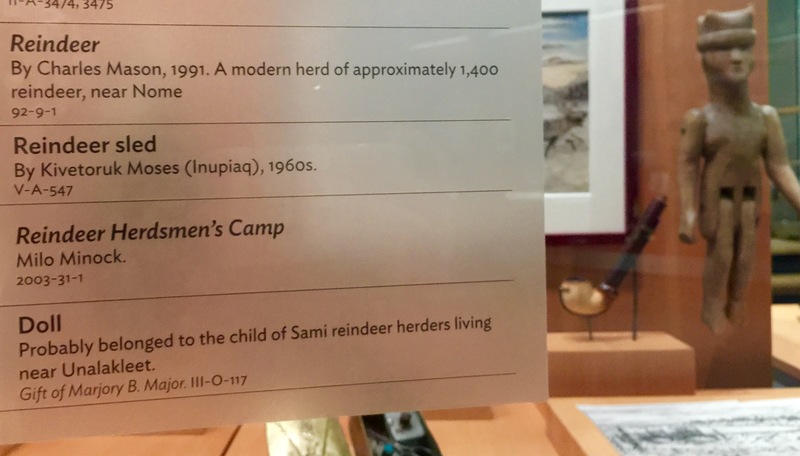 Ruth- I love that you didn’t know reindeer were real 🙂 The story about the Sami people from Norway coming to work with Alaska Natives is really interesting. This is a whole history I knew nothing about. Thank you for sharing! I bet that doll has some stories to tell and we can only speculate. Did the child come with the herders if so what was the journey like coming from halfway around the world or was the child born here in Alaska? Did the native children get to play with the doll too? You can let your imagination run with any scenario and its amazing to think about the dolls history. Nice find Ruth, such a small artifact can be easily overlooked. Believe in reindeer, and reindeer will believe in you! Wow, that’s quite a far ways for a Sami to travel. It is interesting how such a small doll’s circumstances convey such a big shift in the subsistence practices of Alaska Natives in Unalakleet. I, too, would like to know how Alaskans felt about interaction and collaboration with their newfound neighbors from far away.